Tired of your 3D prints always coming out flat and untextured? That’s an easy fix – get some patterning or texturing going with Velocity Painting! Velocity painting… Sounds cool right? 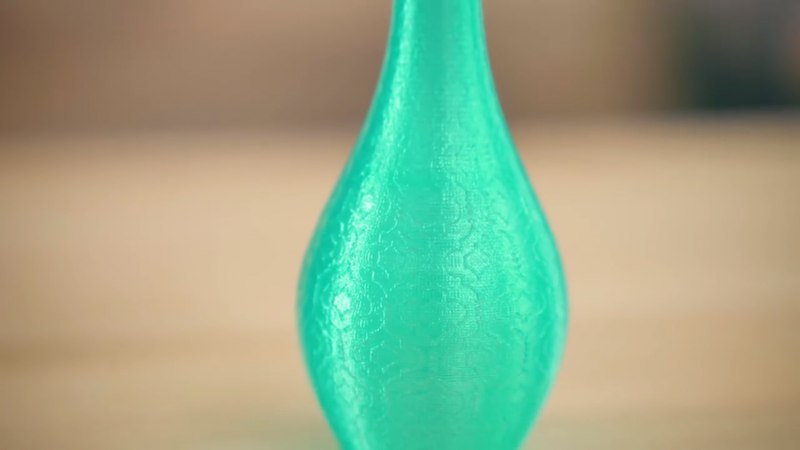 You’ve probably seen it used somewhere out there already, and basically, you can, like, change the texture of your 3D prints without actually changing the geometry. I think this is super cool, and if you’re a bit creative with the technique, you can do so many things with it that aren’t even just for messing around. Well, mostly. It just looks super cool, though. So in this video I’m going to show you how velocity painting works, how you set up the prints and some tricks for how to get the most out of it. So in essence, Velocity painting is a really simple concept. 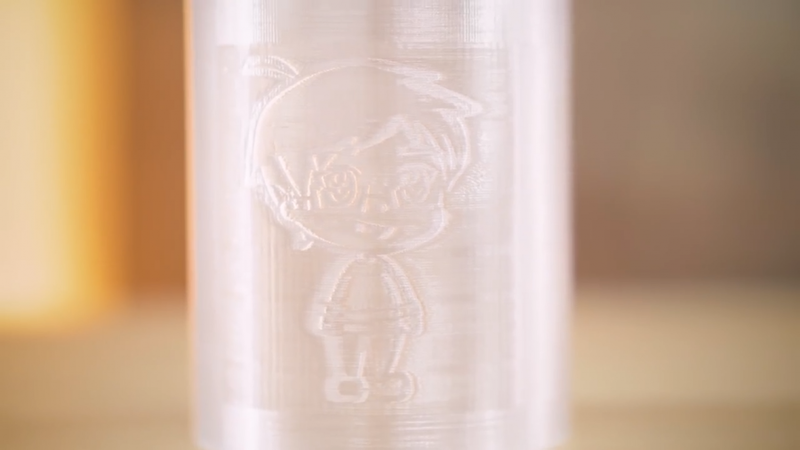 Did you ever notice the little pimples or underextruded bits at the start or end of a line in your 3D prints? Well, those are there because while the motion system is very good at changing speed and direction quickly, your printer’s hotend is not. It can’t just go from extruding slowly to pumping out a ton of material, it always has a bit of lag to it. 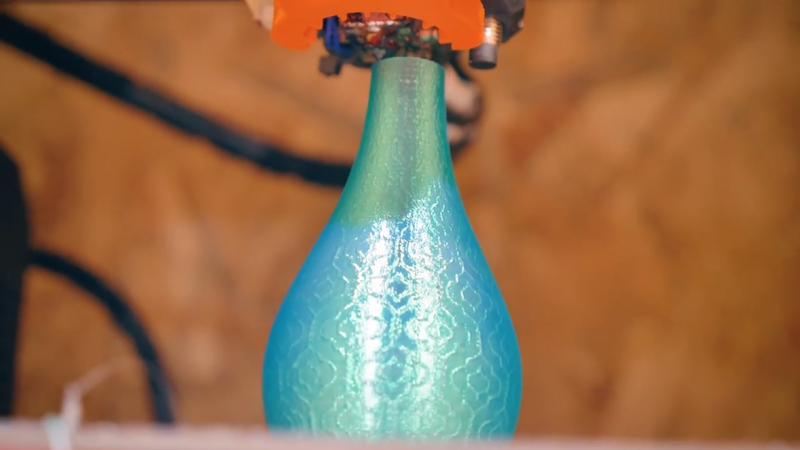 Most slicers and printers try to work around that limitation with a ton of different tricks, but what we’re doing with Velocity Painting is that we’re intentionally using that lag to create patterns, images, texts, burnt into a 3D print. 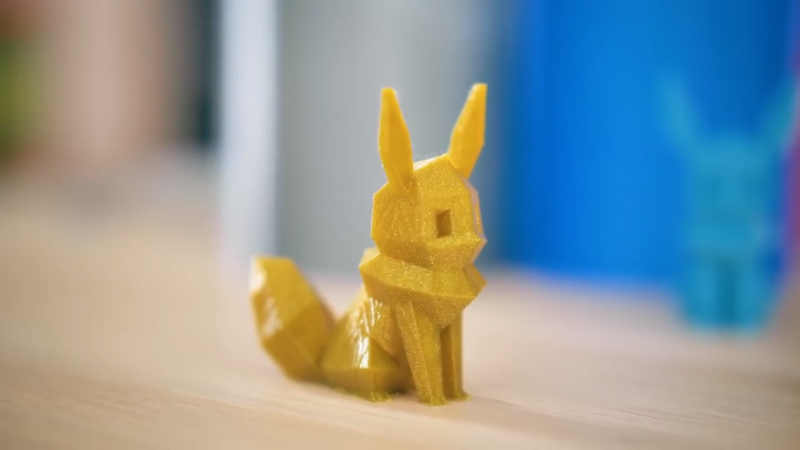 You take your sliced, ready-to-print file, an image that you can overlay, and the Velocity painting tool will turn that image into speed variations in your 3D print that you can actually see in the finished part without actually modelling anything into your 3D model. So, I’ve got two different use cases here, which I’ve already printed out, and there’s a ton more ways to use Velocity painting, which I’ll show you towards the end of the video. But what I have is, like, the straightforward way to use it, you imprint a motive into a part. So what I did is that I simply created a cylinder model, just to demonstrate this, and then used an image to imprint into the part. Here’s how you do that: First, slice your model as usual. I used vase mode for this, but it also works if you use regular infill or several walls, just keep in mind that even the infill is going to get “tatoo’d”. Not that it would matter much, but if your parts need to be particularly strong, Velocity painting might not be the right tool for you. Alright, next up, you’ll need the Velocity Painting software, which you can get from velocitypainting.xyz, and yes, that’s a web address. If you’re on Windows, you probably want the x64 version, but you can also get it for mac OS, or Debian-based Linux systems. The software itself is rather easy to use use. You start at the top where you load in your raw gcode file and your image. You then move down to “Image details”, where you set how large the image projection is supposed to end up on your print. You can get the size of your 3D model from your slicer for reference. 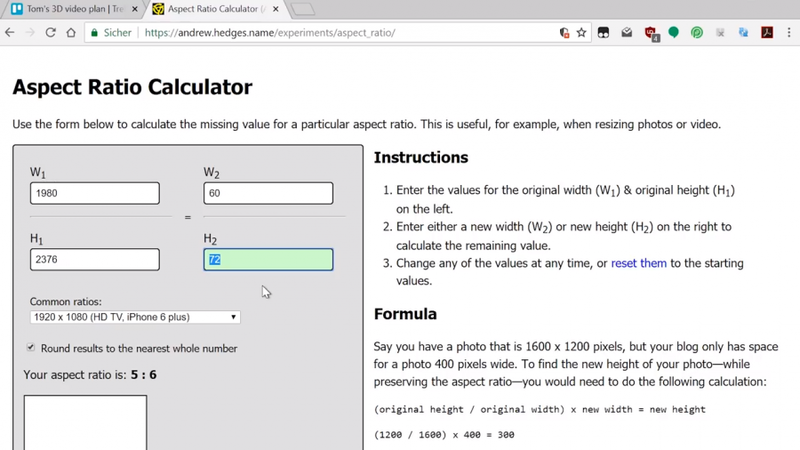 If you don’t want your image to get stretched, use one of the online aspect ratio calculators and your original image size in pixels to figure out what, for example your height needs to be, based on your target width to keep proportions. Z_offset, as the name implies, shifts the image up or down on your print. One box further down, you set what the software calls “printer coordinates”, but basically, you’re setting the spot you want the image to be centered around. So if you want to move the image on the print, change these. We’re going to look at “Print speeds” in a second, but first, let’s check out “Paint type”, as this is the most impactful setting for changing the way the Velocity painting tool works. The default is “Projection X”, and basically wipes your image through the part along the X-axis, so from left to right. Anywhere a bright part of the image grazes the part, it’ll use a higher speed, and anywhere the image is dark, you know, it’ll go slower. And that looks like this! So, mapping the image with “Projection Y” or “Projection Z” is pretty much the same thing, it just wipes the image through your part in a different direction, but the “Cylindrical” and “Spherical” modes are a bit different. So, let’s start with the “Cylindrical” one, I guess the best way to explain this is if you imagine your image as an explosion in the center of the part that goes outwards in all directions equally. So, obvioulsy, you’d use it if you want to paint a world map onto a sphere, or make one of those cool Lithopane moon prints, where you see the surface of the moon as soon as you shine a light through the part. The other option is “Cylindrical”, and it’s kinda similar, but instead of coming from a point and going to all directions, it spreads from a vertical line along the horizontal plane. I don’t know if that makes sense, so here’s another way to think about it: Your image gets wrapped around your part. Easy. This is that typical use case that you use for vases. Vahses. Whatever. 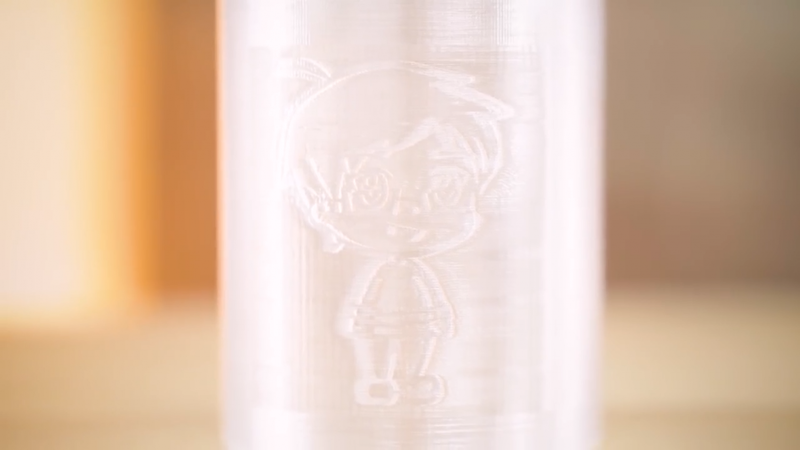 The one bit that we still need to cover is the speeds, and you can, well, you should use it to set up not just how fast your part prints, but also how strong the Velocity Painting effect ends up. The speeds you set here overwrite anything you configured in your slicer before. Going from 20 over 50 to 80mm/s worked out pretty well for me, but it was definitely on the more extreme side. For example, this part printed in transparent ProtoPasta PLA ended up really underextruded in the bits where it started speeding up, and in fact, this isn’t watertight anymore, I can even blow right through it. Also, one thing you shouldn’t forget here – the default is Millimeters per Minute, so if you just input the same ballpark of speeds as in your slicer, you’ll get something like this. So, don’t forget to change it to Millimeters per second over here. Just saying, not that I would have ever forgotten to change it. But the best thing really is just to save the entire thing as a preset. Super easy. Next up, filaments. Not all of them work equally well. This right here was the same gcode on all 3 prints, but the result is totally different. So, this first one is a semi-translucent prototype of DAS FILAMENT Infinity Blue, and I was hoping that the difference in extrusion width that Velocity Painting creates would create a look that kinda changes the translucency in the print, but I think this is actually the one that turned out the worst. The effect is just way too subtle, I think. Next up, the Prusa silver, which is the filament they’re including with printers, and it’s got a really strong metallic effect to it, which tends to bring out printer flaws a ton, but since we are basically creating imperfections on purpose with Velocity painting, the metallic sheen really works in our favor here and makes for a good contrast. Lastly, the Protopasta Iridiscent Ice PLA, I think is the nicest-looking one of the bunch, because you’re not seeing your motive as an surface imprint, but you’re just seeing the effect of the refraction how it bends light, so it’s really strong and really contrasty. Kinda like those computer game demos back when they first figured out how to do glass that looks decent. So, plain filaments it is for me. Anything that has glitter particles or even fibers in it tends to hide the 3D-printed look, so it will also hide the effect of the Velocity Painting. So there’s no point in using them. Cool, so what should you actually put on, or over your prints? I mean, the obvious thing is do is tattooing vases, and that’s alright. For these you’d either use a floral pattern or some pattern that is repeating, so you don’t get that seam in one spot. For this, you slice your vase as usual, vase mode on or off, and then use the cylindrical projection to wrap your image around. It can be hard to figure out what your image proportions are supposed to be. So to get something that doesn’t look like this abomination, here’s an easy way to figure it out. You start with an approximate diameter of your part, in this case, it’s easy, I designed this part, well done Tom, but if you have a Vase that actually has a shape to it, just make an educated guess. Multiply your diameter with 3 and that’s your image width that you can then use with an aspect ratio calculator to figure out how tall you need to set your image to get it roughly proportional. But then again, it can be fun to play with overstreched designs, those can look pretty interesting, too. 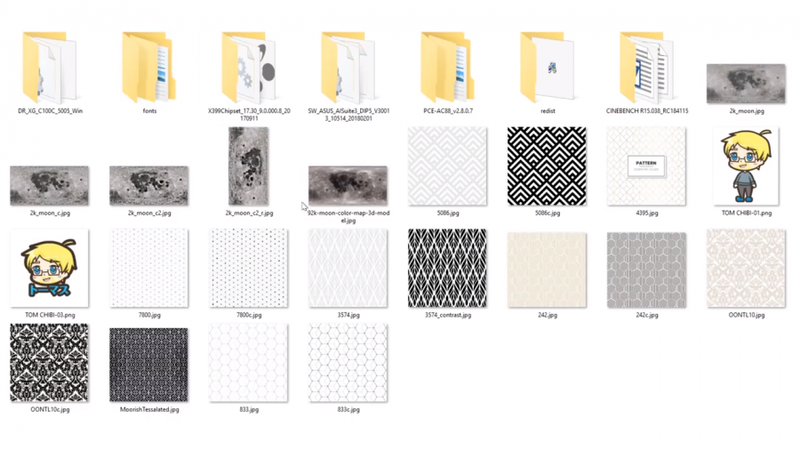 The patterns that I used for these my prints I got from Freepik, they’re just free stock images, basically, but there are tons of other designs out there that you can use, just a quick google of “free pattern” or “free floral graphics” or whatever you’re into will bring up a ton of options. Cool, basics done! Let’s show you 5 more tricks to get the most out of your Velocity painted parts. Ok, Velocity painting works on edges, basically. So if your design has poor contrast to start, give a bit more or contrast in Photoshop or Gimp. You can also play with edge-detect filters for a different look! Because Velocity painting works per layer, if you have a design like this that has continuous vertical bits in it like the top and bottom parts of these hexagons, anything but the start and the end of that bit aren’t going to show up well. What you can do, though, is to simply rotate the design ever so slightly, by 5, 10 or 15 degrees, so that you do get that contrast in each layer. If you want to get a rough idea of how your part is going to look, just preview it! Slic3r doesn’t support loading gcode back into the preview, but Cura does, so open up your gcode in Cura, change the mode to Feedrates, and there you go! 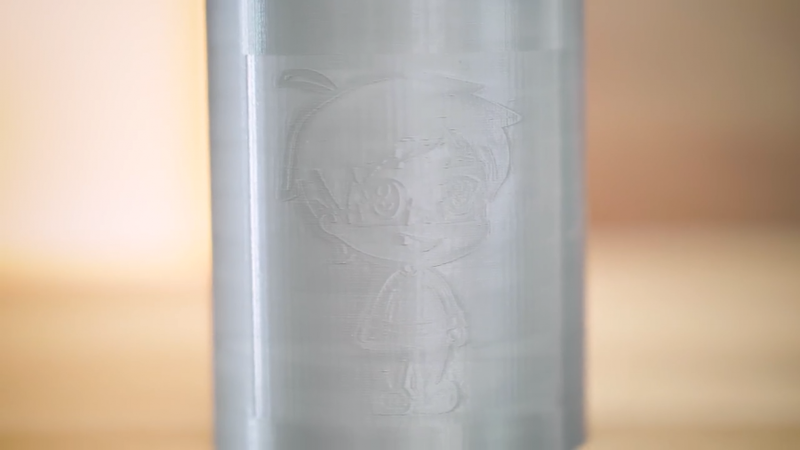 Super easy preview if you don’t want to print a design to to see what Velocity Painting is going to do to it. Or don’t preview it, I mean, surprises are fun, too! #3 Imprint designs without edges! If you look at these prints, they have that frame-like border to them where the design ends and the rest of the part continues. To get rid of these edges, you have a few different options: And because I figured out better ways to do this than what I had originally written in the script, here are those options as voiceover. They all center around blending the speed of your edges with the non-velocity painted region. White is fast, black is slow, and the Velocity Painting tool uses the slowest speed for anything that isn’t covered by your image. So if you have the option to fill the background of your image with a full black, it will just blend perfectly. You can also add a black border on the left and right edges of your input image, and feather it in. This doesn’t completely erase the transition, but at least smoothes it out a ton. Or, very simply, make sure your image covers your entire part and extend it if necessary if you’re using the X, Y or Z projections. #4 Use Velocity painting for non-artistic purposes! So at its core, Velocity painting just maps different print speeds to different areas of your prints. Which means you can use it to just straight-up set speeds for specific areas. So if you need the top of your part printed slower, for example because it’s a very slim part that might fall over, well, create a gradient, and use that with Projection X or Y. If you’ve got several parts that need to be printed at different speeds and can’t set that in your slicer, just put ‘em in different corners and fill those areas in the matching shades in an image file. 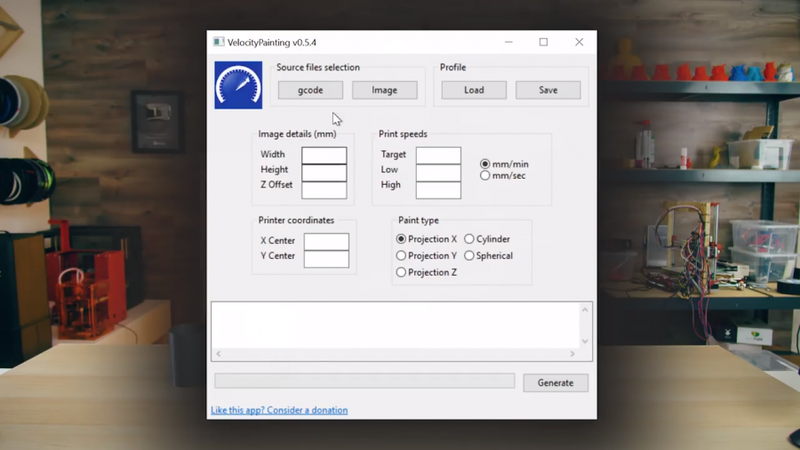 And what you can also use Velocity painting for is to tune in your printer. 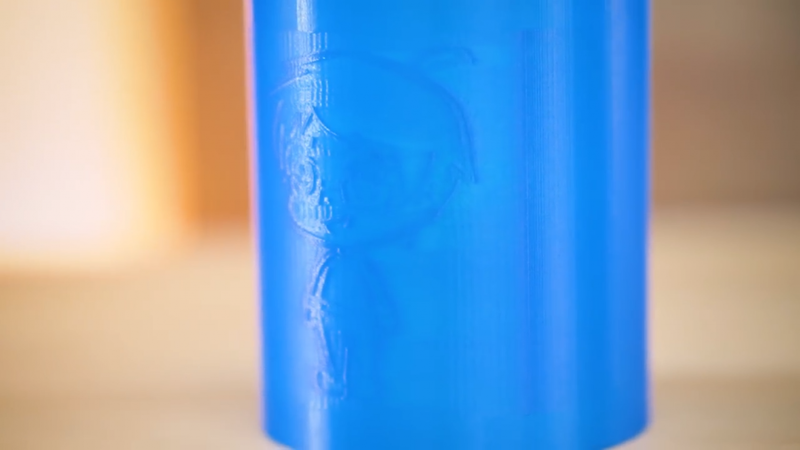 If you’re using Linear Advance, which is meant to compensate for the exact artifact Velocity painting uses, you can tune your linear advance settings so that the Velocity Painted part looks as close to the original print as possible. Of course, it’s basically impossible to get it perfect, and if you use linear advance already, you will have a hard time getting Velocity painting to work as intended. #5 Do your own thing! Velocity Painting is a great tool, even used as-is for the simple stuff, but, like every tool, it’s best used for the things that you uniquely want to do with it. It all comes down to being able to use some simple image editing software, either to improve the designs you already have or create completely new ones from scratch. So definitely look into at least learning the basics in Photoshop and Illustrator or the free alternatives Gimp and Inkscape. And you know what a great place to learn that software is? Today’s sponsor, Skillshare! Wow, that was smooth. Alright, here’s how Skillshare fits in: So they’ve got a ton of online courses that you can take at your own pace, and they’re got everything covered from business development over modelling with CAD, but they’ve also got Meg Lewis’ “Fundamentals of Photoshop” series, which, basically, even if you’ve never used any photo editing software, it’ll show you all the basics and get you right up to speed. Premium memberships for Skillshare start at around $10 a month, but we’ve also got 200 free trials to give away. If you’re one of the first 200 people to sign up with the link in the video description below, you’ll get your first two months of Skillshare Premium for free! These do go quickly, so don’t miss it. Thanks Skillshare! So, what are you going to use Velocity painting for? 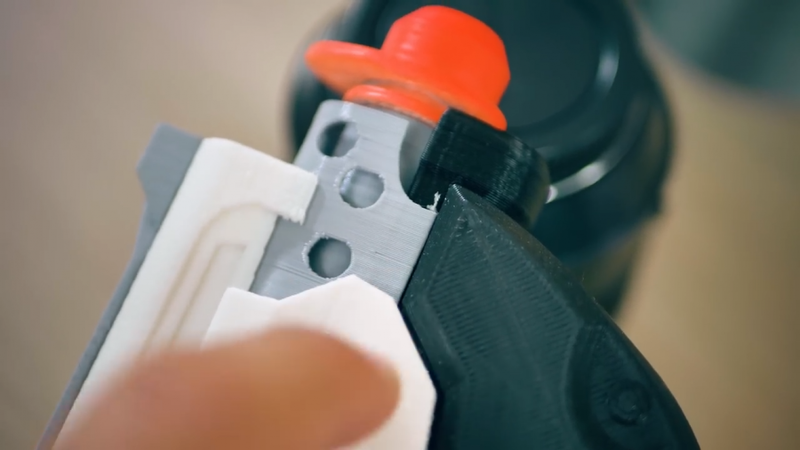 It really works on any printer and it’s so quick and easy to use, it’s almost a waste not to use to for parts you want to make a bit more unique. I’m definitely going to be using it for lampshades where light passes through them, and just for little bits that I don’t want to look as 3D printed as normal, where you’d use particle, sparkle filaments, I’m definitely going to try if I can emulate that look just by adding texture with Velocity Painting. Definitely share what you’re doing with it in the comments below, if you’ve got questions about the process, why not ask them in the forums at discuss.toms3d.org, and, as always, if you feel like you learned something, hit that like button, smash it if you so desire, and if you like what I’m doing here, get subscribed and support the channel on Patreon. Thank you for watching and I’ll see you in the next one! Live Creality Ender 3 Live Build & First Prints!